An allergic reaction to champagne sometimes indicates an allergy to alcohol or any other ingredient in the champagne, such as grapes, yeast or wheat. A common source of a champagne allergy is sodium metabisulfite, a chemical used to preserve alcohol. If you are also allergic to vinegar, pickled onions and dried fruit, the source of your allergy is sulfite, which is present in all of these food items. Even low-sulfite champagne triggers an allergic reaction, as sulfur powder sometimes is used to dust over vines. 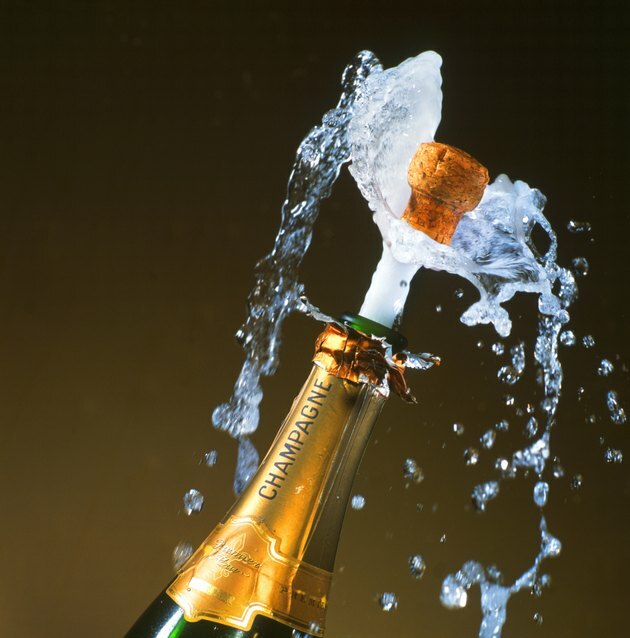 Many people allergic to champagne experience a tingling sensation in the mouth or the lips after drinking it. The Clemson Cooperative Extension website indicates an allergic reaction often begins with a tingling sensation. Swelling sometimes accompanies the tingling sensation, along with hives and itching. Bad headaches are the most common sign of allergy to champagne. In cases of extreme champagne sensitivity, the person can experience painful migraine headaches. This symptom should be carefully monitored; report any headache lasting longer than one day to a physician. A common sign of champagne sensitivity is flushing or redness in the face. People with rosacea and seborrheic dermatitis are prone to experiencing flushing or redness if they are allergic to alcohol. Increased heart rate sometimes accompanies the red-faced reaction. According to Aukland Allergy Clinic, alcohol triggers an increase of the chemical acetaldehyde in the blood, which causes the release of histamines, which makes the skin turn red. Rarely, a champagne allergy causes anaphylactic shock, a life-threatening condition that can present cramps, abnormal breathing and other symptoms. According to the Clemson Cooperative Extension website, danger signs include a feeling of warmth and trouble talking, feeling like the throat is closing up, tightness in the chest, difficulty breathing, vomiting, diarrhea, changes in blood pressure or loss of awareness or consciousness. An injectable epinephrine shot is used to treat this symptom until the person reaches a hospital.